Trump’s Christmas Carol by Lucien Young (Watt T. Dickens) sub-titled Being a Ghost Story of Democracy is a short book (112 pages in hardcover) parodying Charles Dickens’ A Christmas Carol. 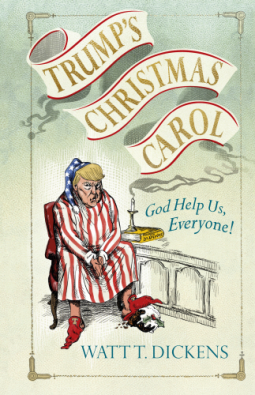 It’s easy reading, amusing and entertaining and Young doesn’t pull his punches, mercilessly portraying Trump as Scrooge, with Richard Nixon standing in for Jacob Marley, warning him he is on a path to impeachment and eternal damnation. He offers him a way to escape his fate – three spirits will visit him to show him the error of his ways. Whilst this is a clever version of Dickens’ book I doubted that Young’s Scrooge would wake up on Christmas Day a changed man. And I much prefer Dickens’ original version where he is criticising Victorian society, its greed, self interest and lack of charity, drawing attention to the terrible living conditions of the poor – in particular to child poverty. Its timeless message is still applicable today.